I hope that all of you in the U.S. had a safe and festive Fourth of July holiday. We enjoyed the day at home with some of our closest friends, squeezing in some quality time before our lives get hectic with events and activities in support my book’s release on September 3. 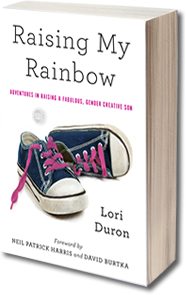 Increasingly, children and teens are attending schools and maintaining their gender independent expression and/or identities. In the process, they are often pushing up against schools and systems not necessarily prepared to support them, requiring caregivers to advocate on their child’s behalf. This panel session will include various individuals who have worked with their schools (often collaboratively but sometimes in the face of strong resistance) to ensure their child’s safety and well-being. As families share their stories, participants will hear various lessons learned and strategies implemented for effectively engaging schools to take the necessary steps to meet the needs of gender diverse students. The deadline to register for the 2013 Gender Spectrum Conference is July 8. And, there will be onsite registration at the event. I will be blogging, Facebooking and tweeting live from the conference. So if you can’t attend, follow me as I learn and grow. 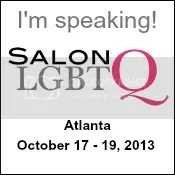 I’ve never been to the Gender Spectrum Conference but have heard such great things about it. I can’t wait to dive in and share my experiences with you. I’m also incredibly honored to be one of BlogHer’s 2013 Voices Of The Year. This year’s VOTY submission process has been a magnificent journey through the hearts and minds of the blogosphere. We are so excited to honor these 100 bloggers — writers, speakers, and artists, who have pushed us to think more, feel more, share more, and do more. They specifically recognized my “My Son’s Christmas Dress” post from the holiday season. Because I am a speaker at BlogHer ’13, my family, friends and fans can get 20 percent off of the conference registration fee. Here’s the registration link and promo code (BH13SPKR) in case you are interested. Will I see you in Berkeley or Chicago? This entry was posted in All Posts and tagged BlogHer, Gender, gender creative, gender nonconforming, Gender Spectrum, Voices of the Year, VOTY. Bookmark the permalink. I will enjoy reading your resulting blogs from both events! I live in Chicago, and would love take my niece’s to see you read at my local, feminist and independent bookstore, Women and Children First. How can I get you to come read out here? Congrats on all your success, and I just love the blog! Oh my God, I’m embarrassed: I just got so excited when I saw “book tour,” I skipped the part where you will actually be in Chicago. So I guess I’m wondering if you would have time to come by the little feminist book shoppe on the north side. I’m volunteering again this year at Gender Spectrum, primarily with getting lunch taken care of. Hope to se you there!